Although the “new” peso, or convertible peso, was introduced in 1994, it was not used as the major monetary exchange in the hard currency food chain until the Cuban government ceased to recognize the U.S. dollar as legal tender in 2004.1 For nearly a decade, from 1993 until November 2004, the U.S. dollar was the principal currency used to purchase food in the “dollar” stores (tiendas de recaudación de divisas—TRDs) and in tourist hotels and restaurants. Old pesos, currently valued at 24 to one convertible peso, are used to purchase food in the ration stores, and in the agricultural and traditional food markets. New pesos are used in the currency collection stores, or TRDs. The value of the convertible peso is now tied to a basket of foreign currencies rather than to the U.S. dollar. Restricting the use of dollars to purchase food in Cuba, along with other Cuban actions and U.S. policy moves, has had immediate impact on both Cuban and foreign consumers. It also has impacted U.S. food sales and has important implications for U.S. food exporters. New peso food originates through domestic production in Cuba and by importing food from the United States and other foreign countries. UBPCs and State Farms are the main national sources of fresh produce for the new peso food market. They operate under the authority of the Ministry of Agriculture (Ministerio de Agricultura—MINAGRI). Processed products of national origin are provided by manufacturers operating under the jurisdiction of the Ministry of the Food Industry (Ministerio de la Industria Alimenticia—MINAL). Fresh Produce: State-owned companies, such as Frutas Selectas S.A., supply the new peso market with fresh fruits and vegetables of national origin. This semi-autonomous company, within the MINAGRI, selects the best fruits and vegetables produced by state-owned farms and state-controlled cooperatives. Frutas Selectas then markets the products to tourist hotels and restaurants. Several other companies, under the jurisdiction of the MINAGRI, supply food and agricultural products for sale through the complex of the new peso market. Companies include: Cítricos Ceiba, Cítricos Ciego de Avila, Cítricos Caribe, CAN, La Cuba, Apicultura, Labiofam, Empresas Porcino, Empresa de Tabacos y Cigarros, Hortícolas, OROCA, CAI Arrocero, Acopio, Empresas Pecuarias, Cuba Café, and Suministros Agropecuarios. Processed Foods: MINAL oversees industries manufacturing milk and meat products, cereals, confections, bread, biscuits and crackers, pastries, fruit and vegetable products, alcoholic beverages, water, soft drinks, beer, and other products. Industries processing bulk commodities, such as wheat, soybeans, and rice, also are under the jurisdiction of MINAL. About one-fifth of the food processed in Cuba earns hard currency, either through sales in the TRDs, tourist hotels and restaurants, or export. Much of the food imported from Canada and the European Union is sold in Cuba for new pesos. Food imported from the United States, according to Cuban officials, has been used largely in the old peso market. Foods imported and sold directly through the TRDs and tourist hotels and restaurants are primarily consumer- oriented products, such as poultry meat and dairy products. Intermediate and bulk products, such as flour, vegetable oil, grains, and oilseeds require processing and enter the food chain through Cuba’s food industries. While meat and other consumer-oriented foods may be imported through several different agencies and companies, most intermediate products and bulk commodities are imported through Alimport (Empresa Cubana Importadora de Alimentos, under the auspices of the Ministry of Foreign Trade (Ministerio del Comercio Exterior—MINCEX). Consumer-oriented foods may also be imported by Alimport to supply the peso market, such as ration stores, school lunch programs, hospitals, and other institutions. Alimport also imports food ingredients for the food industry sector. In addition, TRDs and other government-owned companies may receive food products imported by Alimport. Alimport accounts for about one-fourth of Cuba’s food imports. Other official importing agencies of new peso foods include government-owned holding companies that supply TRDs and governmentowned companies and mixed enterprises that own or operate tourist facilities. Alimport is the only agency authorized by the Cuban government to import food from the United States. Other foreign exporters may sell to one of several importing agencies, as well as Alimport. For example, non-U.S. exporters may sell to ITH (Comercializador ITH, S.A.), the principal company importing supplies for tourist hotels and restaurants. ITH, operates under the auspices of the Ministry of Tourism (Ministerio de Turismo—INTUR). The new peso food distribution network consists of two principal marketing outlets. They are the TRDs and the tourist trade. Other entities involved in the new peso food chain include in-home family restaurants (restaurantes particulares), known generally as paladares, and the underground or black market. The importance of the black market, which deals in old and new pesos, as well as dollars and other hard currencies, has fluctuated with the availability of food through official channels and economic reforms and regulations imposed by the government. Paladares are limited to family employment and may serve only 12 customers at one time. They may charge their customers in either old or new pesos; however, most paladares request new pesos for payment. Bed and breakfast establishments (casas particulares), also licensed by the Cuban government, conduct business much as do paladares. Casas particulares and paladares do not import food products directly, but purchase those products through the TRDs, state-operated agricultural markets, semi-private agromercados, and from other sources using both old and new pesos. The major TRD chains, and the government corporations owning them, include: (1) Tiendas Panamericanas (CIMEX, S.A.), (2) Tiendas Universo (Cubanacán, S.A.), (3) Tiendas Caracol (Caracol S.A.), (4) Tiendas Meridiano (CUBALSE, S.A.), (5) Tiendas TRD Caribe (GAE S.A.), and (6) Tiendas Habaguanex (Habaguanex S.A.). Semi-autonomous holding companies servicing tourism also are important in the new peso food chain. All of the companies, to some extent, compete with each other. Generally, however, each company concentrates on a different segment of the tourist market. As is true for the holding companies servicing the TRDs, there has been no foreign investment in the ownership of the companies. Other holding companies serving tourism include Grupo Hotelero Gran Caribe, Horizontes Hoteles, Habaguanex, Grupo de Turismo Gaviota, Complejo de Convenciones, Isla Azul, Grupo de Recreación y Turismo Rumbos, and Compañía de Marinas Puerto Sol. Gaviota S.A. is a tourism company controlled by Cuba’s military complex. Among other activities, Gaviota imports new peso food for the needs of fourand five-star hotels, restaurants, and cafeterias under its administration. Cuba has approximately 300 tourist properties with about 40,000 rooms. Five-star and four-star hotels account for approximately 40% of the hotels and 70% of the rooms. Three-star hotels account for about 35% of the hotels and one-fifth of the rooms, while two star-hotels account for 25% of the hotels and 10% of the total number of hotel rooms available in Cuba. Annual growth in tourism in the 1990s was more than 15%, but in 2001 the number of tourists was only slightly more than the year before, approximately 1.8 million. A slow start for tourism in 2002 resulted in even fewer tourists, 1.7 million. In 2003 tourism rebounded to 1.9 million, and in 2004 the number of tourists exceeded 2 million. Consumers in the new peso food chain include Cubans who receive remittances, tips from tourists, benefits for working with foreign companies, and with the resources to convert old pesos to new pesos. Foreign consumers in Cuba with hard currencies to convert to new pesos include tourists and foreign business representatives. In addition to remittances, Cubans providing services for tourists may receive tips in dollars. Cubans working for foreign businesses operating in Cuba sometimes receive bonuses in dollars. Some mixed enterprises supplement workers’ income with dollars, either through negotiated arrangements with the Cuban government or through other means. Private enterprises, such as paladares and casas particulares, also earn hard currencies and new pesos for Cuban families. Cuba’s new peso food chain is decentralized and complex. It is an intricate network of organizations authorized to purchase, from domestic production and importation, and distribute food products in Cuba for new pesos, i.e., convertible pesos. Organizations include government agencies, state-owned companies, mixed enterprises (Cuban and foreign participation), associated foreign firms, and licensed private restaurants. In addition, the black market plays a significant role in the collection and distribution of new pesos for food. 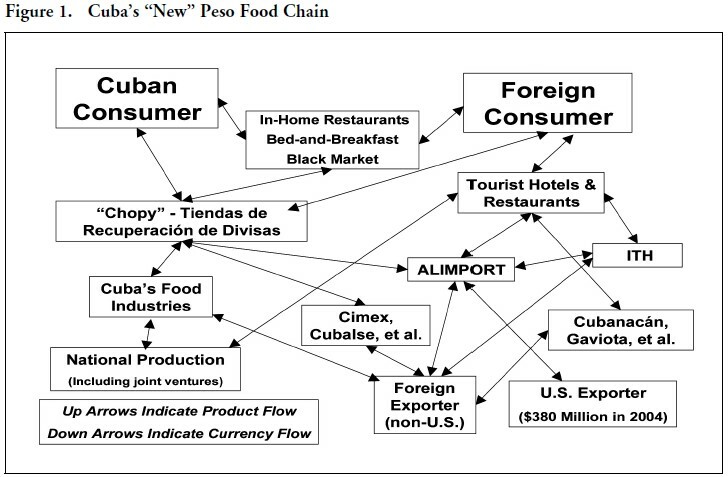 Figure 1 illustrates the linkages between the principal entities constituting the food distribution network in Cuba. Foreign food exporters, other than those from the United States, can market to any of the Cuban organizations licensed to import. For example, foreign exporters can sell to any of 30 Cuban companies licensed to import meat. U.S. meat exporters, however, can only sell to Alimport. This restriction, imposed on U.S. food firms by the Castro administration in May 2002, places the U.S. food companies at a disadvantage. Foreign firms can promote their products direct to the tourist hotels and restaurants. The end-user then can request importation on its own account, through ITH, Alimport, or another licensed importing company. Recent tightening of U.S. regulations restricting sales to Cuba on a cash-only basis has also affected U.S. food exports negatively.8 According to U.S. data,9 agricultural exports from the United States to Cuba for the first half of 2005 fell one-fourth compared to the same period for 2004. Cuba’s closer economic and political ties with Venezuela and China in recent months, also, indicate greater difficulty for U.S. exporters in retaining the share of the Cuban food market achieved in 2004. An increasing role of the Revolutionary Armed Forces (FAR) in the administration of Cuba’s government, especially in tourism, could also have a negative effect on U.S. exporters. Cuba’s military administers major holding companies for TRDs (TRD Caribe) and tourism (Gaviota). Military interests, as compared to commercial interests, may be more likely to want the Cuban government to align itself closely with foreign governments sympathetic to Cuba’s form of government. Because of the considerations cited above and for other reasons, the outlook for growth of U.S. food exports to Cuba—unless both U.S. and Cuban policies become more agreeable—is not favorable to U.S. food and agricultural exporters. 1. For additional details on Cuba’s hard currency food markets see James E. Ross and María Antonia Fernández Mayo, “Overview of Cuba’s Dollar Food Markets: An Exploration of the Purchasing and Distribution System,” Cuba in Transition—Volume 12, pp. 276– 284. Washington: Association for the Study of the Cuban Economy, 2002; and Ross and Fernández Mayo, “Cuba’s Dollar Food Market and U.S. Exports,” Cuba in Transition—Volume 13, pp. 370–383. Washington: Association for the Study of the Cuban Economy, 2003. 2. FOCAL Spotlight on the Americas, April 2005, Volume 4, Number 4. 4. Caribbean Basin Agricultural Trade Office, U.S. Department of Agriculture/Foreign Agricultural Service. GAIN Reports #CU2001, 2002, and 2003. 5. Department of Foreign Affairs and International Trade, The Canadian Trade Commissioner Service, Cuba: A Guide for Canadian Businesses, June 1999. 6. For more detailed information on the holding companies serving tourism, see James E. Ross, “The Impact of Potential Changes in U.S.-Cuba Relations on Midwest Agribusiness Trade and Investment,” University of Iowa, College of Law, Transnational Law & Contemporary Problems, Volume 14, Number 2, Fall 2004. 7. Paolo Spadoni, “The Role of the United States in the Cuban Economy,” Cuba in Transition—Volume 13, pp. 410–429. Washington: Association for the Study of the Cuban Economy, 2003. 8. U.S. Office of Foreign Assets Control (OFAC), U.S. Department of Treasury, on July 29, 2005, attempted to clarify the cash-only requirement of the Trade Sanctions Reform and Export Enhancement Act of 2000 by ruling that cash held by an agent in a third country qualifies as a cash sale. 9. Analysis of U.S. Bureau of the Census Trade Data by Commodity and Marketing Programs, Foreign Agricultural Service, U.S. Department of Agriculture.